Kenneth Ivreson Grina, American Aerospace engineer, former Vice President, Research and Engineering, The Boeing Company. Grina, Kenneth Ivreson was born on June 1, 1923 in Fergue Falls, Minnesota, United States, son of Theodore I. and Martha (Foss) Grina. He completed his education as Bachelor in Aerospace Engineering, University Minnesota in 1946. He has career in aerospace engineering serving as — from chief structures engineer to vice president engineering research Boeing Helicopters, Philadelphia, 1946-1987; as Consultant with Isreali Aircraft Industries, 1989, Boeing Helicopters, 1990; and as Lecturer with Nanjing Aeronautical Institute, China, 1985-1990. Mr. Grina is member of Fellow American Institute of Aeronautics and Astronautics; and American Helicopter Society. 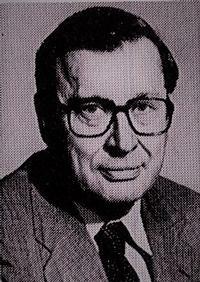 He is winner of AHS Alexander Klemin award, 1984 and AHS Alexander A. Nikolsky Honorary Lectureship in 1993. His Nikolsky lecture was "Development of Helicopter Design Capability — Progress from 1970 to 1993." He has been writing contributor articles to professional journals.